We are traveling to Boston tomorrow through Monday for studio, to visit our project site for the velodrome and experience the great architecture and urbanism the city has to offer. I have never been to Boston before so am really looking forward to it. Our studio progress is going well. I set up a collaborative blog at isuvelodrome.wordpress.com for my project team to document our process and self-critique as a way to keep progressing and clarify the expression of our design. I’ll post more about the trip upon our return. This semester our 5th Year Architecture comprehensive studio project is for a 12,000-seat velodrome (an indoor competitive cycling track) in Cambridge, Massachusetts, on an open site along the Charles River that is currently used for athletic fields. During the first week we were challenged to choose a past theme from Cabinet Magazine, from which to construct a conceptual frame and thesis relating to the discipline of architecture, the City of Boston, and competitive cycling. I was quickly drawn to the Spring 2001 issue theme, “Mapping Conversations” and became even more intrigued upon reading its features. In Frances Richard’s article Utterance is Place Enough she explores what maps are and how we create and use them to define our places and communication spatial comprehension (directions perhaps). Mapping is a method for articulating the existing of things in our physical environment – by showing them on a map, it establishes their importance or permanence. In regard to conversation, it is abstracted as an unscripted verbal exchange between two or more participants. Since it is unpredictable and not pre-established, conversation is not permanent in the way things and places are in space, rather it is a temporary discourse. Continuing, how is mapping conversation different from writing? Richard argues maps and writing are artifacts experienced once removed, whereas conversation is experienced up front and necessarily interactive. Mark Lombardi created “narrative structure” drawings using lines and notations to index or “map” discourse between political and financial leaders to expose fraud and abuse of powers. Warren Sack looks at mapping very large-scale conversations through the contemporary medium of the internet. Historically mass conversation took place in large-scale public spaces, but the internet can reach a much greater audience with anonymity, but also allows for more direct feedback or discourse. Sack looks at social media networks, “mass media,” and other digital dialogue, using several different kinds of graphs and charts to establish themes and comprehension of these large-scale conversations. 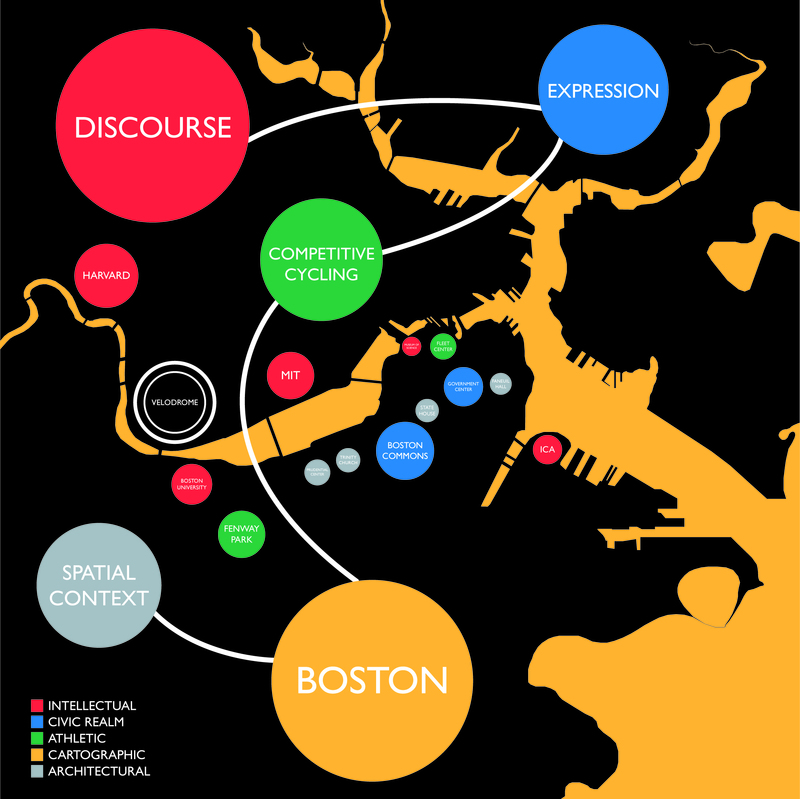 From these articles, which I admittedly summarized pretty poorly, I took the mapping aspect and began to consider the different kinds of actual, spatial, and conceptual conversations active in Boston that would or could in some manner contribute to or have an effect on the proposed velodrome. Utilizing the colors of Boston’s subway lines, I devised five different categories or layers of “conversation” to be represented. Particular institutions and places are mapped geographically, which are significant participants in their given color-coded conversation. Then I was able to create a framework for the design of the velodrome and how it will engage and contribute to these conversations currently taking place in the city. I often use word diagrams, arrows, and notations to organize and plan out objective and key components of a design or piece of writing, so this was actually a very constructive exercise for me. Last weekend was full of travel. Last Thursday to Friday (Feb 4-5) we had a short overnight class trip to Perugia, Umbria, followed by a three day weekend for travel on our own. I headed up to Norway with three others and it was a blast, but I’ll talk about that in my next post. We left Rome around 8am on Thursday aboard a double decker charter bus, which was kind of fun. It was my first time out of the city since arriving about a month ago, so I was looking forward to seeing the countryside and just somewhere else besides Rome. On the way to Perugia we made a few side stops along the way. First in the small hill town of Bagnaia to visit Villa Lanta (16th century) with an elaborate formal garden with fountain and water features flowing down the hill above the town. We stayed there for a little over an hour to explore and do some sketching. 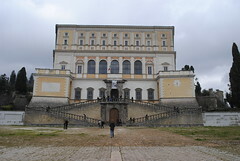 Our second stop was at Palazzo Farnese (photo to left), an enormous 16th century mansion in a very rural town Caprarola. 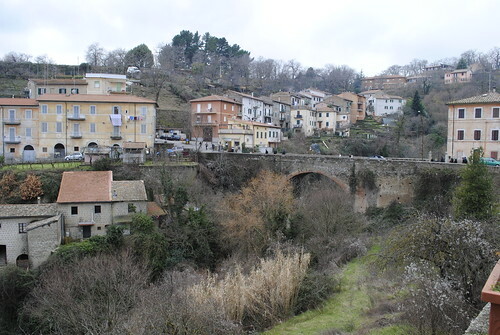 Similar to Villa Lanta, it sat above overlooking much of the small town. On the short walk from the bus we had majestic views of the deep valleys and hillside dwellings (photo at top). We only went through one floor of the Palazzo, which were all elaborately decorated with frescos painted on just about every wall and ceiling surface. Then we made a quick stop nearby for food tasting of a few different local foods, wines, and naturally carbonated water. The next leg of the bus trip was longer, going through very hilly and forested areas. The road had very sharp turns, switching back and forth up and down terrain. The countryside was beautiful and a nice change of scenery from the dense grittiness of Rome. Despite winter, much of the ground was still mostly green. We arrived in Perugia around 5:30pm, just as it was getting dark. Outside of town there were occasional small industrial buildings along the highway. Entering the city was actually quite sudden. I was surprised by the size and modernity of the newer areas, with more towers, glass and steel than can be found in Rome. 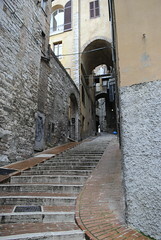 But this certainly did not characterize all of Perugia, which originated as a medieval fortress atop a hill. The old historic center remains a vibrant place, connected to the newer city below by MiniMetro, an automated people mover system, as well as an extensive escalator corridor going up the hill. A wide pedestrian street Corso Vannucci at the top is flanked by several tiny “streets” that crawl up and down the terrain, winding around agglomerations of buildings. Unlike most of the medieval streets in Rome, the majority of these were completely inaccessible except on foot, many only a meter or so wide. A lot were also built over, either partially or completely, making the typical meaning of street even more inapplicable. They were very foreign, especially since they are all still functioning, providing access to operating businesses and residences. The multidimensional, multilayered urbanism here simply cannot be found in America. 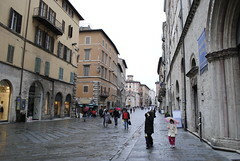 Hilltop Perugia was very posh with several stylish outlets along Corso Vannucci. It was very clean compared to Rome and the small side streets were very well lit. The paving material was also a lighter stone and brick compared to the standard dark gray cobblestone used most everywhere in Rome. Our hotel (Hotel Priori) was just off Corso Vannucci on one of these side streets. That evening we had a group dinner with all students and professors at All Mangiar bene (translates: “All Eating Well”) located down one of the side vias. It was a multi course Italian dinner with two appetizers, soup, spaghetti, salad, turkey dish, pork chops and sausage; followed by dessert, coffee, and a lemon liquor. Needless to say, it was intense and very filling. A brick arched ceiling characterized the dinning room, with only a few small windows at one end, giving it a very medieval, almost dungeon-like vibe. The following day on Friday was left for exploration and sketching. I walked down the hill first to find the train station with a few friends who needed to catch a bus there later to get to their own weekend travels. I then wandered around the modern city around and took the MiniMetro back up to the top. It was drizzly, gloomy and cold that day so everyone was pretty much ready to leave when we the bus came back around 3pm. The bus trip back to Rome was pretty uneventful with one quick stop at an AutoGrill truck stop. Back in Rome it was pouring rain, not making for a fun way back to the apartment. We were dropped back off at the Piramide Metro station where we had met the bus on Thursday, despite driving right by the apartment where the majority of us live. Waiting ten minutes in the pouring rain for a local bus to come was no fun at all, but hey, its Rome. Perugia was a nice short trip outside of Rome and neat to see a smaller Italian city. See photos here. This past week I, along with ten or so other classmates, participated in the For a Frugal Approach in Architecture International Symposium and Design Workshop, sponsored by the Bruno Zevi Foundation. 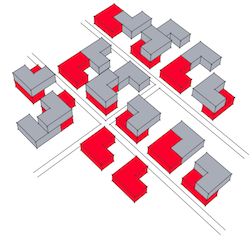 The focus was frugality in architecture, specifically for post-disaster emergency housing. The symposium started on Thursday (Jan 21) with a day of lectures from a number of international leaders in the field, including Nina Maritz (Namibia), Jorge Mario Jauregui (Brazil), Giorgio Goffi (taly), Sarah Wigglesworth (UK), Eko Prawoto (Indonesia), and Danny Wick from Auburn’s Rural Studio in Alabama. It was held at the Citta’ dell’Altra Economia (“City of the Other Economy”), a part of an old slaughterhouse complex converted into exhibition and meeting space “for the promotion of the economy” related to agriculture, trade, and renewable energy, etc. It was a neat conversion but for this event the space was a bit too small (not enough seats) and did not seem to be heated. Logistics of the event was interesting since every speaker had to be followed by a translation between Italian and English. It also started at least half an hour late and presenters tended to go over their allotted time amounts – but punctuality certainly doesn’t seem to be common in Italy. Admittedly the whole day seemed to drag on, but I particularly enjoyed Giorgio Goffi’s work, and Danny Wick’s presentation on the Rural Studio was especially interesting. On Friday we met at the Faculty of Architecture (department of architecture) at Sapienza University in Rome for the design workshop. American students from Northeastern University and Roger Williams University also participated. We were each paired with an Italian student to design a proposal for an emergency housing unit for the Abruzzo region near L’Aquila in response to the April 2009 earthquake there. We began at 9am and had until 7pm to finish, which ended up being extended to 8. The night before I had familiarized myself with the Abruzzo area and the extent of the disaster. My partner Marcella came with a basic design layout and some thoughts on materials, so we just built off of that. The language barrier was at times challenging (we referred to Google Translate on occasion) but she spoke English pretty well so it wasn’t really a problem. We decided on a fairly simple L-shape with a half courtyard space in the SW corner. Each adjacent dwelling was set back halfway from the previous to permit ample direct sunlight to the courtyard windows for solar heat gain in the winter. For the east and west walls we decided to use thick stone walls (available from building rubble) to create thermal masses that could absorb solar heat during the day to be redistributed during the cooler night. There were some issues we didn’t get clarified and were not optimal for environmental conditions. My partner told me most of their curriculum is design-based and didn’t really have classes on building tectonics or passive design for environmental controls. It was a nice realization of how much I have actually learned at Iowa State about not only design, but also how buildings go together and how to harmonize them with environmental conditions. Some of the architects who spoke the day before came for a while and walked around to check on the progress. Nina Maritz talked to us earlier on when we were still clarifying specifics of materials and orientation. Later one Giorgio Goffi stopped by, but only spoke in Italian. He had suggested considering our L-shape as a starting point and how they could be used to create a variety of different sizes and forms. This was not a bad idea, but it made it more difficult to clarify specific decisions regarding solar orientation, tectonics, and of course organization. We attempted to show both ideas – the variation that Goffi suggested, and the more specific possibility of one L. However the new abstract L variety got rid of the original relationship between adjacent units, making several material and orientation decisions less significant. In the end we sort of ran out of time and had a less than stellar presentation – we both agreed it was not good graphically and did not represent our ideas well. But we discussed a lot of interesting strategies during the day, so it was a really good learning experience. The program wrapped up Saturday morning with visual presentation of the proposals and discussion from the panel of speakers. Unfortunately it was extremely unorganized with slides out of order and starting half hour to an hour later than scheduled. The discussion was interesting and informative, but like many professors and experts, almost everyone had to get the last word in, even if it was simply to agree with and over reiterate someone else’s point. Following the discussion orderves and champagne was served in a small courtyard next to the auditorium, so all was good. Overall “Frugal Architecture” was exhausting, but a great experience. Getting insight into architectural education in Italy and the different perspectives and approaches the students bring was extremely valuable. It was also a terrific opportunity to challenge my own communication skills and knowledge of architectural and environmental systems. Monday, Jan. 11 – Today was the start of semester classes in Rome. We meet at Palazzo Cenci, a fairly significant 16th century building at Piazza delle Cinque Scole (five schools), where ISU College of Design has space on an upper floor. It is just across the river from Trastevere where my apartment is, in the former Rome Jewish ghetto. 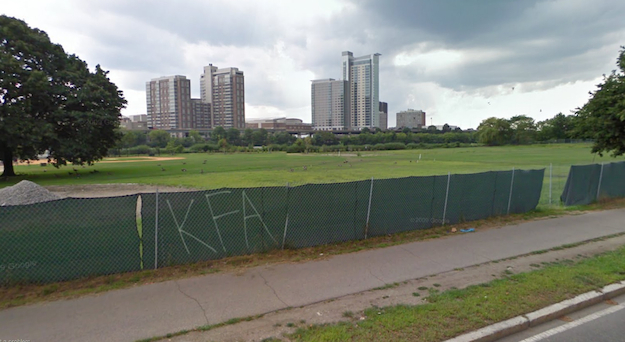 (See walking route to studio here.) We began at 9:30 with a brief orientation. On the walk there I stopped with my friend Jenna at a coffee bar on Isola Tibenna (Tiber Island). The coffee bars in Rome are tiny bars where people come in and drink and eat quickly standing up at the bar and then go on their way. The coffee comes in very small cups. At this particular bar, you pay first at the cashier and take your receipt to the bar. I was unsure how what to say, so I requested the same thing as Jenna ordered before me – espresso e cornetto (crossaint) – for €1.80. At the bar the barista asked if I wanted cioccolato (chocolate) or creme (cream). I asked for creme. Now I know the next time to order cappuccino e uno cornetto. Back to studio we had a drawing lecture from a faculty member from Ames, then broke into our studios. My studio met in a back room with access to the terrace. We spent the remainder of the day experimenting with different grades of charcoal and other drawing mediums. At the end of the day our instructor Chris took us on a short walk around a few nearby blocks pointing out some noteworthy places and amenities. For dinner another friend made salad and manicotti with the remaining lasagna ingredients from last night. Tomorrow is supposed to be at least partially sunny so I hope to take some photos of the neighborhood and studio. For class we have a language course and another drawing session.